Download the eBook PDF here. The growing of the beard is from the affairs of the innate nature of man (i.e. it is from his Fitrah) upon which Allah has created him. It is from the Sunnah of the Prophets (may the peace and blessings of Allah be upon them) and from their guidance. Allah has distinguished men from women with the beard and He has beautified the man with it. In the past, the beard was a sign of manhood, distinction from femininity and a sign of adulthood in males. Unfortunately, in our times, the beard is no longer seen (even by many Muslims) as a sign of manhood, masculinity or religious duty. Indeed, in many circles masculinity itself is portrayed as a threat. 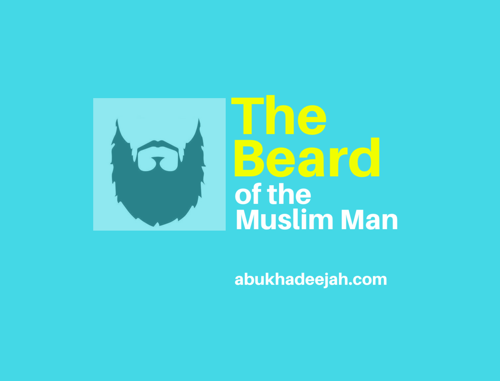 This short article aims to discuss the place of the beard in the life of a Muslim and the Sharee’ah rulings concerning it. There are many today who say that the beard is not obligatory claiming that in the past it was only optional and “traditional”, and Islam did not obligate it upon the believing men. They say that Islam leaves the affair to the tastes of the people and according to the environment and society around them. So, what is the beard and what does Islam say about it? Linguistically, the beard refers to the hair that grows on the cheeks and the chin. It is referred to as al-lihyah (singular) and al-lihā or al-luhā (plural). Al-lahyi is a reference to the jaw bone which is called al-lahyiyain (in dual form) because they are the two bones that hold the teeth of humans and animals — and it is the skin that covers the entire jaw bone upon which the beard grows. In religious terminology, the beard is the hair that grows on the two cheeks comprising the hair that extends from the ears to the cheeks (the sideburns), from the cheekbones down to the chin. The temples and forehead are not considered to be the place of the beard. What is above the upper protrusion of cheekbone is not considered the beard as that is the area of the temple, and thus, a part of the head, not the face. It is stated in the hadeeth of Ar-Rubaya’ (may Allah be pleased with her) that, “The Prophet (صلى الله عليه وسلم) would wipe his head, his temples and ears once [during wudu].” And it is not reported from anyone that he (صلى الله عليه وسلم) would wash his head along with his face. Nāfi’ narrated from Ibn ‘Umar from Allah’s Messenger (صلى الله عليه وسلم) that he said: “Be different from the pagans; grow your beards [long] and trim down the moustaches.” When Ibn ‘Umar would perform Hajj or ‘Umrah, he would take hold of his beard and cut whatever remained beyond a fistful. Growing the beard and trimming the moustache is from the Fitrah (innate nature). It is from the Sunnah of the Prophet and the Prophets who came before him (may Allah’s peace and blessings be upon them all). To grow the beard and shorten the moustache is a direct command from Allah’s Messenger (صلى الله عليه وسلم). To disobey a command is a sin that leads to Allah’s punishment. The specific manner of the Muslim in growing the beard and trimming the moustache differs from the fashions and religious practices of the Jews, Christians, Hindus, Magians, Sikhs, Buddhists, etc. This makes the Muslim distinct and unique in his religious adherence. Growing the beard distinguishes the man from the woman, and shaving it makes him resemble the woman. Allah (the Most High) and His Messenger (صلى الله عليه وسلم) cursed the man who resembles the woman and the woman who resembles the man. The long, abundant beard and the trimmed moustache distinguishes a man with nobility, manliness and masculinity making him clearly different to a woman and he is made handsome in her eyes. Growing the beard is from the outward acts of imān (faith), is a cause for its increase because Ahlus-Sunnah believe that obedience to Allah and righteous deeds increase imān. Shaving the beard or trimming it beyond what is allowable is a sinful deed that decreases imān. Ahlus-Sunnah believe that disobedience to Allah decreases imān. These ahādeeth (and many more) prove that altering the outward appearance beyond what is allowed is a sin that earns the curse and punishment of Allah. From the affairs of the fitrah (innate nature) with which men are created is to grow the beard and to trim the moustache as I have mentioned in the hadeeth of the fitrah reported by Muslim. And this is something that Allah’s Messenger (صلى الله عليه وسلم) commanded with. Therefore, to shave the beard is forbidden. As for trimming the beard, then there are guidelines present in the understanding of the Companions of the Prophet (صلى الله عليه وسلم) and trimming is not open to one’s whims and self-adjudication by gathering examples from the sayings [and mistakes] of the scholars and using them as a proof – especially if those opinions take one beyond the actions of the Prophet (صلى الله عليه وسلم) and his Companions. Allah has commanded the Muslims to follow the Prophet (صلى الله عليه وسلم) to obey him and to keep away from what he has forbidden, and to follow the path of the Companions (رضي الله عنهم) and their understanding. And whoever’s saying or understanding differs from this foundation, then it is not accepted regardless of their station. How Serious is the Issue of Shaving and Trimming? There is a hadeeth collected by At-Tirmidhi (no. 2762) wherein it is said: “The Prophet would take from the width and length of his beard.” This hadeeth is fabricated (mawdoo’) as stated by the scholars of hadeeth because there is a narrator in the chain called ‘Umar ibn Hāroon Al-Balkhi who was accused of lying. So, this hadeeth cannot be used as a proof for cutting the beard unrestrictedly from its length or its width. To act upon this fabricated narration opposes the authentic Sunnah. Furthermore, to act upon it knowingly just because it agrees with one’s desires is an added calamity that combines opposition to the Sunnah with following one’s inclination to imitate the unbelievers. Shaikh Ibn Bāz (رحمه الله) continued: “As for shortening the beard and reducing it, then there is no doubt it is an evil and it opposes the authentic narrations. However, it is lesser [in evil] than shaving it all. As for the one who does that, then he is a sinner and not an unbeliever. He is not a kāfir even if he believes it is permissible if that is based on his erroneous understanding and blind-following of some scholars. And it is obligatory to advise him and warn him from this evil act. That is because there is some differing among the scholars as to whether it should be left to flow or whether it can be shortened [by cutting whatever extends beyond a fistful]. As for shaving it all, then I do not know of any scholar who permitted that. However, we do not declare the one who holds it permissible (halāl) to shave the beard to be an unbeliever if that is due to his ignorance and his blind-following of others. This is different from those prohibitions that are known in the Religion by necessity due to the clear proofs. So, if one was to declare those prohibitions (i.e. what Allah has decreed as harām) to be permissible (halāl) then that would be major kufr – that is if he was living among the Muslims [and therefore had no excuse of claiming ignorance]. But if he lived among the non-Muslims or in a distant desolate place far away from the Scholars [so he does not know halāl from harām], then this person should be shown the proofs, and then if he persists in claiming that the prohibitions (i.e. the harām matters) are permissible (halāl) then he has disbelieved. Examples of this are: fornication, drinking alcoholic drinks, eating pork and so on. That is because these are prohibitions known in the religion by necessity and the evidences of prohibition are clear in the Qur’an and Sunnah.” However, the Muslim who commits these sins knowing them to be unlawful (harām), and without claiming they are halāl (permissible) then he is a sinner and not an unbeliever because he has not challenged the Revelation but instead has fallen into a state of weakness in faith (īmān). But to declare what is clearly harām in the Qur’an and Sunnah to be halāl is an act of unbelief that exits one from the Religion. The Muslim who fornicates, drinks alcohol or partakes in the evil act of homosexuality is not considered an unbeliever (kāfir) unless he claims that these acts are permissible (halāl). That is because the sinner recognises the authority of Allah and believes in the Revelation without challenging it and seeks forgiveness for his sins and repents by feeling remorse and giving-up the sinful act. An-Nawawi (رحمه الله) stated in his explanation of Saheeh Muslim (3/194): As for the saying of the Prophet (صلى الله عليه وسلم): “I’fā’ul-lihyah” then it means to let it grow and that is the meaning of “Awfū” as occurs in another narration. It was the habit of the Persians to trim the beard so the Sharee’ah forbade it, until it there came five different narrations: “A’afū”, “Awfū”, “Arkhū”, “Arjū” and “Waffirū” and the meaning of all of these words is to leave the beard to grow as it is. That is what is apparent from the narrations that encompass all these different words.” Ash-Shawkāni (رحمه الله) said similar to this in Naylul-Awtār (1/131). There were some scholars who still held it impermissible to cut what remained after a fistful. The reason for the differing is due to the fact that Ibn ‘Umar is one who narrated that the Prophet (صلى الله عليه وسلم) said: “Grow the beard.” Yet it is Ibn ‘Umar himself who cut the beard. So, those scholars who held it impermissible to cut from from the beard said: “The importance is given to the narration of the narrator and not to his view.” And those who allowed cutting said: “The narrator is the one most acquainted with the intent of what he narrated.” So, they said that Ibn ‘Umar did not oppose what he narrated from Allah’s Messenger (صلى الله عليه وسلم) rather, his action explains what is meant by letting it grow. From the scholars who held it permissible to cut from the beard what remains after taking hold of it included: Mālik ibn Anas, Ahmad ibn Hanbal, ‘Atā, Ibn Abdul-Barr, Ibn Taymiyyah and others. Ibn Hāni said: I asked Abu Abdullah (Ahmad ibn Hanbal) regarding a man who takes from the sides of his face. He said: “He can take from his beard that which extends beyond a fistful.” So, I said: What about the hadeeth of the Prophet (صلى الله عليه وسلم): “Trim the moustache and let the beard grow.” He (Imām Ahmad) said: “He can take from its length [as stated above] and from below his throat.” And I saw Abu Abdullah taking from the sides of his face and from under his throat. The growing of the beard is a religious obligation in Islam. It is prohibited to shave the beard and none from the Sahābah and the early scholars and jurists permitted shaving. To take from the beard and to shorten it such that it is no longer plentiful and abundant is also harām because it opposes the command of the Prophet to grow the beard in all the various wordings of the ahādeeth. However, one may cut what remains after taking a fistful such that it does not contradict the beard from still remaining plentiful and abundant. The sin is of levels with respect to the beard – so, the sin of shaving is greater than the sin of trimming it shorter than a fistful. The issue of leaving the beard to grow or trimming the beard after taking a fistful whilst it still remains plentiful and abundant is a point of [legitimate] differing among the scholars of the past and present, and both positions are supported by proofs. As for those Sahābah and early scholars who allowed trimming of the beard, then they allowed it after a fistful and we know of no one from the Sahābah who permitted shortening beyond that. Whoever shortens the beard less than a fistful, trims it down or shaves it then he is advised to fear Allah and to be dutiful to Him because he has done something reprehensible. And the one shaves it is worse than the one who trims it. As for the man who lets it grow plentifully and abundantly and then trims whatever remains after a fistful, then he is not rebuked at all just the Companions are not rebuked such as Ibn ‘Umar and Abu Hurayrah (رضي الله عنهما). Lisān al-Arab (15/243), Mukhtār as-Sihāh (p. 248), Al-Misbāh Al-Muneer (2551). Abu Dawood (129), Tirmidhi (34) declared hasan by Al-Albāni. Hāshiyah Ibn Ābideen (1/68), Al-Mughni of Ibn Qudāmah (1/115), Sharhul-Muntahā of Al-Bahooti Al-Hanbali (1/25). Ahmad (5/265). Al-Haythami said in Al-Majma’ (5/131): It was reported by Ahmad and At-Tabarāni and the narrators of Ahmad are all the narrators of the Saheeh except Al-Qāsim and he is reliable and speech concerning him does not harm this narration’s authenticity. Muslim 261, Abu Dawood 53, declared hasan by Al-Albāni. Tirmidhi 2761, An-Nasā’ī 5047 (saheeh). Declared hasan (good) by Al-Albāni in Takhreej Fiqhus-Seerah, p. 359. Fathul-Bāri 10/351, Hāshiyah Ibn ‘Ābideen 2/205. Muslim, 2077. See Tamām Al-Minnah of Al-Albāni, 1/78. Sunan Al-Kubrā of Al-Bayhaqī, 9/234, Ibn Taymiyyah stated that its chain of narration is authentic in Iqtidā As-Sirāt Al-Mustaqīm, 1/457. See Wujoob I’fā il-Lihyah wa Tahreem Halqihā wa Taqseerihā of Shaikh ibn Bāz (رحمه الله) and his Majmoo’ Al-Fatāwā, 3/373. Abul-Waleed Al-Bāji in Al-Muntaqā Sharh Muwatta, 4/367. See Al-Masā’il of Ibn Hāni (2/151). Jāmi’ Bayān al-‘Ilm wa Fadhlihi, 2/229.